Acer has taken a punt on a new design for this hybrid, but the rotating screen is a mixed bag: its extra positions don’t add much to the experience and, while this machine is thinner and lighter than rivals, it’s wider and has iffy aesthetics. It’s inconsistent elsewhere too with reasonable core specs, battery life and a good screen, but a poor keyboard. It’s got issues, but it’s the best mid-range hybrid available at the moment. Despite the fact that the Aspire R13 isn’t listed as the most premium convertible, we can easily say that the notebook strikes us as one. Yes, Acer has kept low cost materials for the most of chassis, but they still leave the impression of an expensive piece of electronics. The only full metal is used for the frame around the screen making it more durable, while the interior has a metallic finish and strongly resembles an anodized aluminum. The bottom is also plastic and just like the one we found in the Aspire V15 Nitro series notebooks, it feels really smooth and helps for a firmer grip in tablet mode. Speaking of which, you may find the device’s sides a bit protruding when using the tablet mode and maybe way too big for the screen size presented in the device. The keyboard and the touchpad are maybe the only drawback in the overall design and we were left with the impression of inconsistent performance due to the wobbling effect when using the mouse keys and the short travel of the keys. 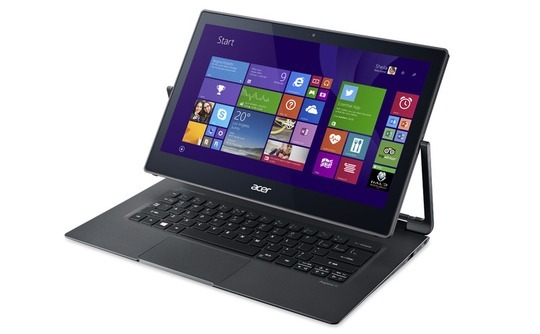 If you're sold on the idea of a convertible for the versatility, or just thinking about one, the Acer Aspire R 13 should be on your short list. With six operating modes, you're sure to find a few different ways to use it, and the impressive battery life lets this portable be portable most of the time. The only thing holding it back is the keyboard.